Another in the line of larger smartphones, the Samsung Galaxy Note 3 offers plenty of accessible features all wrapped up behind a beautiful large, impressive display screen. However, the display screen alone is not the only reason to purchase this impressive smartphone, one of the best in larger designs available on the market today which attempts to bring the best of both smartphones and tablets into one device. Combining ridged, chrome edges with backing that feels like leather, the Galaxy Note 3 comes across more like a retro-briefcase from the 1960s, yet sports a very modern, almost futuristic feel compared to many other smartphones on the market today. In fact, the unique backing is perfect for handling the phone and provides a no-slip surface for a surer grip. An elegant and sophisticated look dominates the overall design of this product which measures 6” x 3.1” and only .33” thick. Considering all the features that are packed into this thin design, the Galaxy Note 3 manages to pull them off brilliantly. The 13 megapixel camera lens and LED flash are neatly designed into the back of the phone along with the battery and microSD card slot. With larger size comes a larger screen. 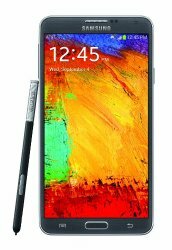 The Samsung Galaxy Note 3 is certainly no different as it boasts an impressive 5.7” screen that is sharp, clear and brimming with color. Everything that the Galaxy Note 3 boasts is built around this screen. Of course, to properly utilize all the functions of the screen, the S Pen stylus must be used. It is kept neatly tucked away in the bottom lip of the phone, but can be used quickly and easily to access the information that you want. Taking pictures is a snap as well, thanks to the front-facing 2MP camera which provides clear, neat pictures, but is augmented by the 13MP rear camera that offers great clarity and beautiful pictures. The video capture is also impressive thanks to the 1080p system that allows for wonderful video that teems with colors. The easy controls and larger size of the phone actually helps in accessing the video along with many of the great features of this camera. The quad-core Snapdragon 800 provides plenty of speed that is augmented by the 3GB of RAM. This makes the Galaxy Note 3 one of the fastest in its class on the market today. The speed is really augmented by the unique design of the interface which, along with the S Pen, allows for quick access to the many features and apps that this camera has available. In essence, Samsung has managed to integrate the hardware, software and interface into a smooth, clean design that actually helps speed up access to the features inside. There are certainly numerous highlights to the Samsung Galaxy Note 3 smartphone, but arguably the best is the complete package of features that center on the impressive size of the display screen. Get the best cell phone family plans in your area today. For current customers, upgrade to Samsung Galaxy Note 3, Black 32GB with AT&T phone upgrade specials online.